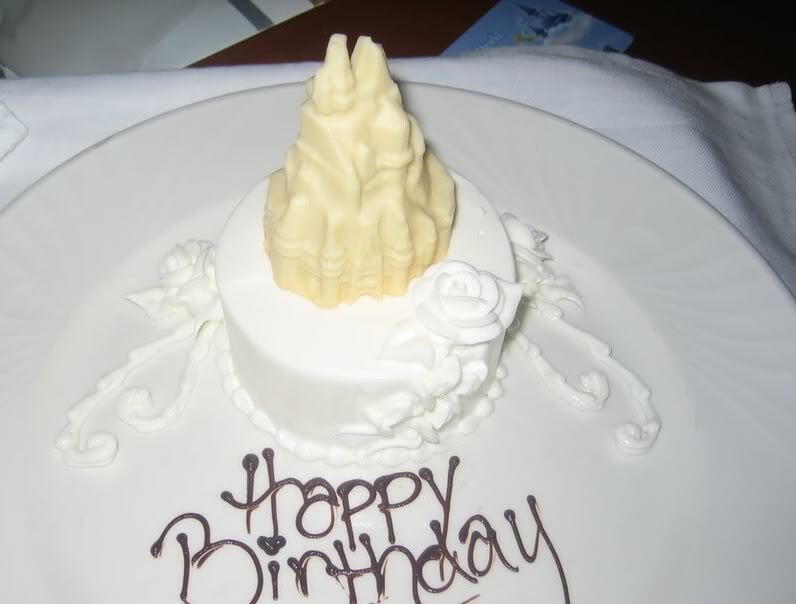 You can have a cake delivered to your Disney hotel room or to most Disney table-service restaurants. Alternatively, you can order a cake for pick-up at BoardWalk Bakery. STEP 1: Find the Disney resort or theme park where you want the cake delivered on THIS LIST. STEP 2: Call the phone number for your location on that list to place an order at least 72 hours ahead. 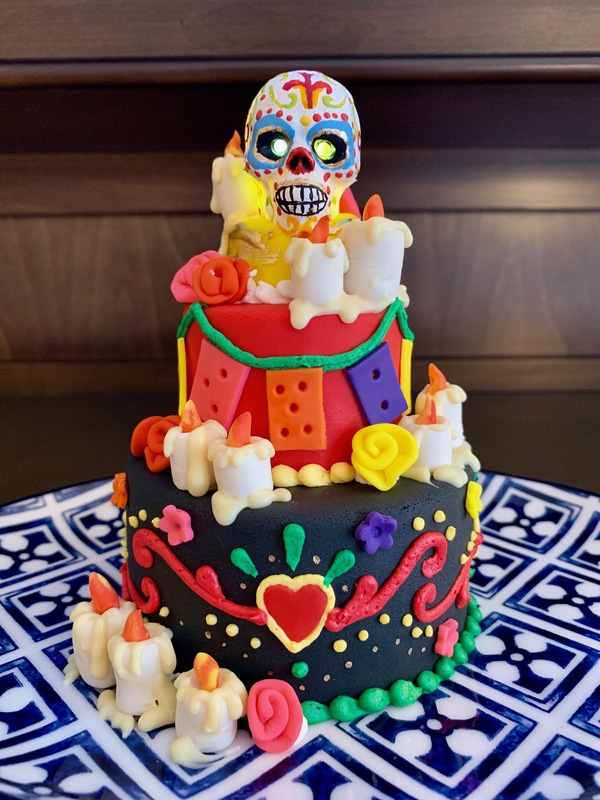 There are no standard design options other than THESE—every cake is a custom cake, so feel free to submit images that show the pastry team what you have in mind. How do I order a cake at ______________ ? For Disney-owned and -operated locations at Walt Disney World, call the Cake-Ordering Hotline at 407-827-2253. For the Swan & Dolphin, the Four Seasons Orlando and Disneyland, see the bottom of this FAQ. Is there a web site for viewing cake choices? Not at this time. You can see photos of the standard custom cakes on this page. The best resource for photos of unique fancy Disney cakes is the DIS Boards’ Cake Chatter Thread and the Flickr photo albums I’ve culled from it. Is there an email address for ordering cakes? Only the Magic Kingdom (WDW.Magic.Kingdom.Specialty.Desserts@Disney.com) has a public email address for placing orders, but they no longer offer custom cakes. For all other locations, you will need to call to place your order. It is sometimes possible to request an individual cast member’s email address so that you can send in a cake photo. Can I get a cake delivered to my room? At resorts that offer Private Dining, yes. For any other resort, follow the prompts on the Cake Hotline to speak with someone at your resort about the availability of delivery. You do not need to be in the room when the cake is delivered, but you must be checked in to your reservation. Can I pick up a cake somewhere? BoardWalk Bakery offers the option to pick up a cake with at least 72 hours’ notice (standard 6-inch cakes like those available at restaurant podiums can be purchased with no notice). Private Dining at the Contemporary and the Grand Floridian may be allow you to pick up a cake at one of the restaurants in the resort without a reservation. If you’re staying at a resort that doesn’t offer Private Dining, you can pick up a custom cake at the resort food court or restaurant by placing the order with the resort via the Cake Hotline. Can I get a cake at Disney Springs? There are no longer any Disney-owned restaurants at Disney Springs, which means you’ll have to phone each restaurant individually to see whether it offers custom cakes. Information on cake options at some of the Disney Springs restaurants can be found on the Cake Options By Location page. Can I order a cake for someone else? This is tricky. When you place the order, you will be required to provide a credit card number, but Disney often charges the room or the restaurant bill, so your friend will have to pay the bill. Also, sometimes the server doesn’t realize there is a cake for the table, so if no one in the party knows about it and reminds him/her, it may never appear. No less than 72 hours ahead of time for simple cakes. For complicated fondant designs, at least 1 week’s notice is necessary. Disney will take your order up to 90 days ahead, but be sure to reconfirm it a few days out to be sure it hasn’t been lost. What size cake do I need for my group and how much will it cost? Prices for fancy cakes start at $32 on top of the price for a basic cake in the size you want. When do I pay for my cake? Usually you pay when it is delivered to you at the restaurant or it is added to your hotel bill upon delivery to your room. However, if the cake is being made by the pastry team at a different resort than the one where you will receive it, you may be required to pay for it when you place your order. Cakes delivered to your room at a Disney resort with Private Dining will incur the standard Private Dining delivery fee (currently $3) and service charge (currently 18%). Cakes delivered to a meal at a restaurant will be added to the total bill for the meal. This allows you to apply Tables In Wonderland, AP, DVC and other discounts to the price of the cake, but it also means the price of the cake will be included when they calculate any automatic gratuity like those associated with large parties and Tables In Wonderland. Do I need to bring my own candles? No. Disney’s table-service restaurants provide candles upon request. Options vary by location, but there is always chocolate cake with chocolate frosting and vanilla cake with vanilla frosting. See our Disney Cake Options By Location page or call the Cake Hotline to speak to someone about the options where you are staying or dining. What if I want red velvet/carrot cake/something besides chocolate or vanilla? Most bakeries have limited flavor options, but Deluxe resort pastry teams and Epcot can accommodate certain special requests. Some pastry teams charge more for specialty flavors. Note that carrot cake and fresh fruit fillings are not available for mini cakes. This is a list of flavors for cakes made by the Grand Floridian’s wedding cake team. Because they are separate from the teams that make other celebration cakes at the Grand Floridian, the parks and the other resorts, not all of these flavors may be available for non-wedding cakes. But it never hurts to ask! What are the most popular flavor combinations? Where can I get a fancy, fondant-covered cake or a mini cake? Prices for fancy, fondant-covered cakes start at $32 on top of the price for a basic cake in the size you want (see above). Prices start at $35 for two-tier mini cakes, which serve 2. Can I get a fancy, fondant-covered cake or a mini cake in a theme park? Only at Epcot, excluding restaurants in the Mexico, China, Italy, Japan, Morocco, and France pavilions. Place your order through Epcot’s Food and Beverage department: 407-560-6395. I got married at Walt Disney World. How do I get a re-creation of the top layer of our wedding cake? Contact your wedding planner. If your wedding was in the last five years, they can access your BEO to get an exact description of the cake and send it to the Grand Floridian’s wedding cakes team. Note that there will be a hefty delivery fee if you want the cake sent anyplace besides the Grand Floridian. Alternatively, BoardWalk Bakery can replicate any of the standard Escape Collection cake designs. Otherwise, you can submit photos to any pastry team on property to help them replicate your cake. Is the frosting buttercream or whipped cream? Standard 6-inch cakes are frosted in buttercream, while custom-ordered cakes may be available in a choice of buttercream or whipped cream. I don’t like the taste of fondant but I want an elaborate cake. What should I do? Disney’s cakes come with a layer of buttercream underneath the fondant and can be served with the fondant removed. You can also specify whether you want vanilla or chocolate buttercream underneath the fondant. Which characters can I get on my cake? Any character from the extended Disney family (Muppets, Pixar, Disney Junior, et al.) except Winnie the Pooh & Friends. (Note: Awareness of this rule varies, so if you want Pooh, it never hurts to ask.) Characters cannot be sculpted 3-D, they must be rendered as a flat screen print directly on the cake or on a standing piece of white chocolate. The exceptions are the white chocolate character statues available for an additional charge at certain Deluxe resorts. 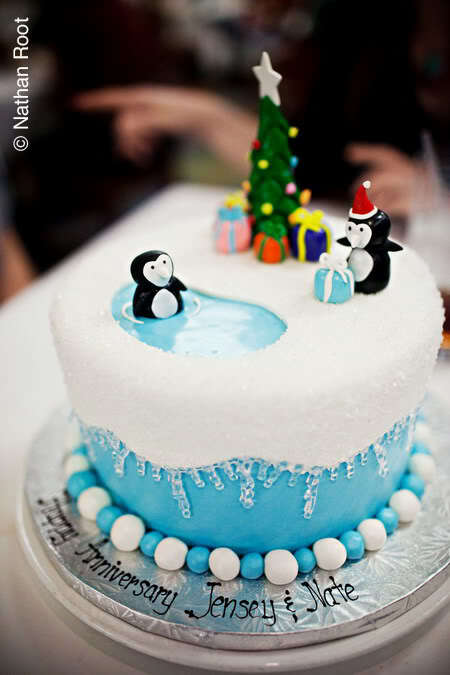 Alternatively, you may be able to work with the bakery to provide your own plastic figurines to be placed on the cake. Which white chocolate characters are available? In general, white chocolate characters are only available at the locations that offer fancy, fondant-covered cakes (see Disney Cake Options By Location page). 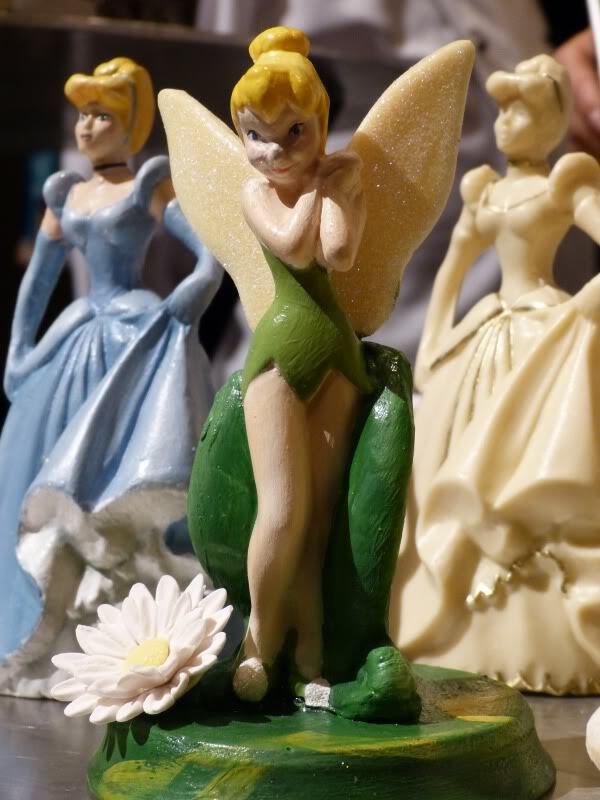 Prices are $15–$65, depending on size and resort, and figures can be fully painted for an additional charge. The selection varies by location, with the Grand Floridian offering the widest variety. Check with the bakery at the resort where you want to order the character. Can I get a cake shaped like something besides a circle or a square? The Grand Floridian is your best bet for a specially shaped cake, although the Contemporary and the Yacht & Beach Club may be able to do certain styles. Can I send in a picture of what I want? Once you make contact with a Disney cast member through the Cake Hotline, you can work with him or her to e-mail photos to the pastry chef. Can I get something other than a cake, like chocolate-covered strawberries? Your best bet is to be staying at a Deluxe Resort, since their private dining menus usually have a section for “celebrations” or edible “amenities” you can have delivered to your room. Click here for a sample of the cake-alternatives at the Contemporary Resort and Animal Kingdom Lodge. You’ll need to contact private dining at your resort to see what they offer, since every resort does something different. Where can I get a mini cake? The Grand Floridian, the Contemporary, Yacht & Beach Club and BoardWalk Inn or any location serviced by these bakeries. Where can I get a mini-castle cake? The Grand Floridian or the Contemporary and any location serviced by these bakeries. Where can I get the chocolate Cinderella Slipper Dessert? The Cinderella Slipper Dessert is available at the Grand Floridian, the Contemporary Resort, and Cinderella’s Royal Table at the Magic Kingdom. It is usually white chocolate, but Cinderella’s Royal Table also offers it in milk chocolate. See this page for more info. What if someone in my party has dietary restrictions? In general, Disney will do its best to accommodate dietary restrictions like allergies, but it’s best to call to find out your options. Usually they will refer you to vegan bakery Erin McKenna’s Bakery (née Babycakes NYC) at Downtown Disney, which delivers two-layer 6-inch cakes (serves 8–10) to restaurants on Disney property for $52. The price of the cake is $59 if you pick it up at Erin McKenna’s. Call 407-938-9044 to order (Monday – Friday, 9am–5pm). Erin McKenna’s offers gluten-free, wheat-free, soy-free, casein-free, egg-free, vegan and kosher baked goods. Certain other Erin McKenna’s Bakery items—like mini cupcakes, cookies and doughnuts—can be found in the gift shops at the Beach Club and Kidani Village; at Jambo House’s quick-service spot, the Mara; in the food courts at Pop Century and Art of Animation; and at Animal Kingdom’s Gardens Kiosk, a food-allergy info booth near Flame Tree Barbecue and It’s Tough to Be a Bug. Will the restaurant hold my leftover cake until the end of the night? Disney’s official policy forbids this as a food-safety precaution, but some guests have been able to get Disney restaurants to hold their leftover cake. Just don’t count on it. How do I order a cake at the Walt Disney World Swan or Dolphin? These resorts are not owned by Disney, so you must call them directly at 407-934-1614 to place an order at least 48 hours in advance. How do I order a cake at the Four Seasons Resort Orlando at Walt Disney World? You must call Private Dining at the Four Seasons directly at (407) 313-7777. They offer the standard cakes below, or you can work with the pastry chef on a custom cake by filling out the order form they will send you. How do I order a cake at Disneyland? Disneyland has a much smaller operation, with one central bakery that makes the cakes for all the resorts and full-service restaurants in the parks. They only offer 6-inch cakes ($33) or 10-inch cakes ($52), along with quarter ($67), half ($92) and full ($132) sheet cakes. A 19% service charge is added for cakes delivered to Disney resort rooms. Disney requires 48 hours’ notice for all custom cakes. To place an order if you are staying at a Disney resort, call 1-714-300-7526 and select Option #2. To place an order if you are not staying at a Disney resort, call Disney Dining at 1-714-781-3463. My recommendation is to order from local bakery SusieCakes in Costa Mesa. They don’t do fondant-covered cakes, but they do make the best, moistest old-fashioned buttercream cakes—and they taste WAY better than any cake I’ve ever had at Disneyland. If you order directly from SusieCakes, the delivery fee will set you back $35. But if you use the app/website Postmates, the delivery fee is closer to $15. Available for delivery to all Disney-owned and -operated table-service restaurants and Deluxe resorts with Private Dining. Limited quantities are available on the spot, but it’s best to call a day or two ahead. Day-of quantities are limited, so make arrangements prior to dining. 72–48 hours ahead is a good idea. No advance payment required if you have a confirmed dining reservation. CLICK HERE for photos of basic custom cake styles. If you’re looking for an elaborate fondant-covered cake, a mini cake, or cakes in nonstandard flavors, only the bakeries at the Grand Floridian Resort & Spa, the Contemporary Resort, BoardWalk Inn, Animal Kingdom Lodge, the Yacht & Beach Club and Epcot offer these, and only BoardWalk Bakery will let you pick up a cake. However, if you’re staying or dining at the Polynesian Resort, you can get a fancy cake by calling Private Dining at the Grand Floridian. For fancy cakes at Wilderness Lodge, and Fort Wilderness, call Private Dining at the Contemporary. At Epcot, only restaurants serviced by the Epcot food and beverage team offer fancy cakes; restaurants in Mexico, China, Italy, Japan, Morocco, and France are serviced by outside vendors. Fancy cakes are also available at Caribbean Beach, Old Key West, Pop Century, and Saratoga Springs Resort & Spa, which are serviced by BoardWalk Bakery, and at Art of Animation, which is serviced bythe Yacht & Beach Club. For these resorts, call the Cake Hotline and follow the prompts for your resort to place your order. You can pick up your cake at the restaurant or food court; many resorts will even deliver it to your room. Complete details on the cake choices and prices at each park and resort can be found on the Disney Cake Options By Location page. To order, call Walt Disney World’s Cake-Ordering Hotline at 407-827-2253. At this time, Disney has no email address you can write to with a cake inquiry, and there is no Disney-run web site showing cake options and prices. When ordering a fancy custom cake, you may run into difficulty with Private Dining cast members who are not aware of the bakery’s capabilities. Politely ask to speak to the pastry chef directly so that you can get the official word on cake options. We are getting married in Orlando, off site. We are having a small lunch at Paddlefish afterwards and want to get a cake. Is it possible to get one delivered there or will we have to pick it up from one of the bakeries on property? Thanks. Paddlefish doesn’t do its own cakes, but you may be able to have one delivered by Erin McKennna’s at Disney Springs. Alternatively, you can work with a local bakery like It’s Tasty Too, which has delivered many cakes to Disney property in the past and could probably meet you at the restaurant. Hi, my brother will be getting married in a few months over at Disney World, but the small package he chose doesn’t come with a cake! Who would be the best place to contact to get a small “wedding” style cake made? I called the Grand Floridian and a few of the bakeries such as Amorette’s but I haven’t had any luck. Maybe I’m not asking properly, ha. It really just be a 2 tier with an 8″ and a 6″, maybe a castle topper. This site is a blessing, thank you. Hi, I wanted to order a buttercream mickey cake for my twin’s bday because my kids don’t like ganache or mousse and that new mickey ears ganache cake wouldn’t work for them. 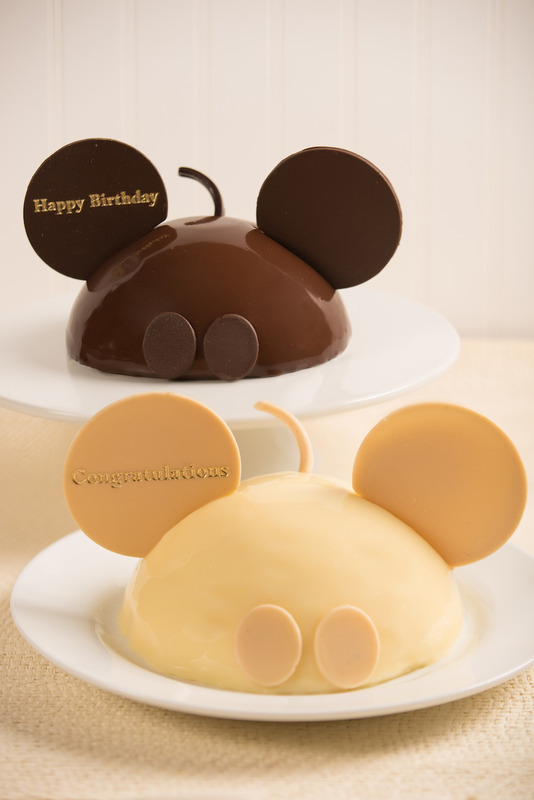 Is there a way to order a simple mickey buttercream cake for our reservation at the Crystal Palace in Magic Kingdom? I know you’re a blogger and not a disney rep but you know so much and I was wondering if you knew. Thank you for your time! Unfortunately, the Magic Kingdom only offers one special dessert at each restaurant now and no other kind of cakes. At Crystal Palace, it’s a “Honey Crunch Cake” and you can see it here: https://disneytravelbabble.com/how-to/order-cake/magic-kingdom-specialty-desserts/. If your heart is set on a buttercream-covered Mickey head cake, you best bet is to be staying or dining at the Contemporary, Fort Wilderness or Wilderness Lodge. All of those are serviced by the Contemporary resort, which has one of the only pastry teams I’ve seen willing to do the buttercream version of the Mickey head cake. Just be sure to send them a photo and confirm that you’re not getting the ganache version. If you are having a Disney’s Fairy Tale Wedding, your planner can submit your cake inspiration photos to the Grand Floridian pastry team to see if they can be re-created. I order last Saturday the mickey mouse cake I had it before and it was great back in January 2016. I was not happy with this one so disappointed they didn’t put chocolate ganache I was not expecting that buttercream frosting . Hi! Who you contact depends on where you want the cake delivered. This page gives you the numbers and options for all locations: https://disneytravelbabble.com/how-to/order-cake/by-location/ If you call Grand Floridian private dining at the number listed, they can look up your BEO to get the style and flavors of your cake. You would need to be dining at one of their restaurants to have the cake delivered there. Congratulations! Thanks for this. Is it possible to order one and collect it from the Boardwalk Bakery it somewhere as we don’t have any onsite dinner reservations? Yes! You’d just place your order directly with BoardWalk Bakery at the number above and then pick it up there. Do you know if you can request to have a specific character to bring the cake over to your table? Apparently that is against policy for the characters, I guess because then other guests will ask why Goofy didn’t bring THEM a cake. If I’m going to Disney for a birthday, but not staying on property, am I still able to order a cake from Boardwalk Bakery to be picked up and brought to our dinner? Is there an album somewhere of images that can be screen-printed onto an 8 inch basic cake? Thanks! I wish! Unfortunately, you have to communicate with Private Dining at each location and ask them to send you images. It would be sooooo much easier if they had a website where you could just pick what you want! Hi I am after a Disney castle cake topper and was wondering if you sold them? If I want to order a birthday cake for the Be Our Guest Restaurant, I have to call the Cake Hotline?